WARNING! Only use industry professionals to work on your wireless backhaul equipment! Wireless backhaul systems (telemetry UHF/VHF radio, unlicensed wireless backhaul, licensed microwave link, millimeter wave 60GHz and 80GHz gigabit wireless, etc.) should only be serviced and repaired by industry professionals that are factory trained. Wireless backhaul systems are proprietary and no two are the same. No two wireless installation projects are the same. Wireless backhaul systems can be fragile and can also be extremely dangerous to work on. Especially if there is any heights involved (e.g. roof tops and communication towers). 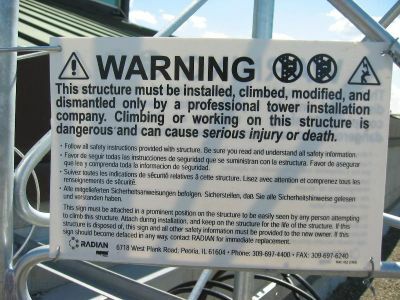 By law (OSHA) and to be insured to climb on a mast or communication tower an individual must be tower certified and properly insured. Never let a vendor who does not meet this criteria to work on you system. AO Wireless has a 100% safety record (ask to see our safety manual). The other major issue with wireless Ethernet bridge systems today is that many are IP based and should only be worked on by a technician that understands and is trained in IP networking. A simple task like updating firmware can damage your system if not done correctly. Alpha Omega Wireless consistently earns the business of new clients because of its ability to effectively work on existing wireless backhaul systems. AO Wireless works with many organizations performing annual preventative maintenance ("P&M") work and keeping organizations up and running. AO Wireless can get your wireless backhaul back up and running quick!